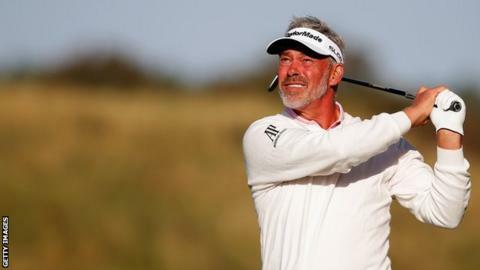 Darren Clarke made the cut at the KLM Open after an impressive 67 on Friday but Michael Hoey and Gareth Maybin both exited. Clarke recovered after his opening 73 to end on level par after a round which saw him going to the turn in 30. However, Hoey exited on four over after an inconsistent 71 which included six bogeys, three birdies and an eagle. Maybin's hopes of holding on to his tour card were also hit as he fired a second successive 72. The Ballyclare man's top-10 finish in Switzerland last week moved him up to 110th position in the Race to Dubai, with the leading 110 set to retain their playing privileges for next season. Maybin's 72 at the Kennemer Golf & Country Club in Zandvoort included five bogeys and three bogeys. Simon Thornton boosted his slim hopes of retaining his tour card after a 69 on Friday left him as the leading Irishman, in a share of 23rd place on three under. Thornton is currently 147th in the Race to Dubai standings, some £60,000 away from the crucial 110th spot. Padraig Harrington is sharing 31sth spot on two under after firing a 68 on Friday while Damien McGrane  and Shane Lowry  both survived on one under. Peter Lawrie is certain to exit on two over after a 70 with Kevin Phelan  finishing alongside Hoey and Maybin on four over. David Higgins also missed the cut after his 74 left him on six over and another trip to the Tour School is looming for the Kerryman. Leader Pablo Larrazabal is 10 ahead of Clarke after a superb 62 on Friday left him on 10 under. The Spaniard is two ahead of Edoardo Molinari and France's Romain Wattel who fired a 65 on Friday with Peter Uihlein, Richie Ramsay and Soren Hansen all on six under.